The African penguins on Dassen Island are not the only ones in trouble. Dassen is home to nine other species of seabirds that are carefully monitored by Cape Nature, the organization responsible for the island. 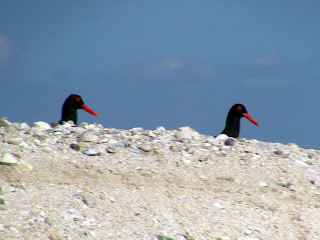 Two of these most important species to South Africa are the African black oystercatcher and the great white pelican. The African black oystercatcher is a threatened species with only an estimated 5,000 birds left. 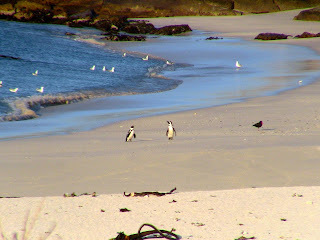 They nest on several of South Africa's coastal islands. They are very skittish and can be easily disturbed leaving their nests open to predation. Habitat intrusion has been a big problem for them. However, there are promising signs on Dassen. The public is not allowed to come to the island thanks to Cape Nature's rules. 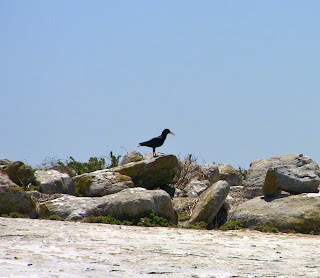 Oystercatchers can be seen all around the shoreline. 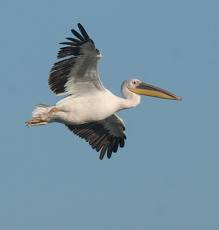 The great white pelican can also be found on Dassen Island. I am told that its status is being monitored internationally, but is not as severe. For this region though, there is only one other coastal island in southern Africa that these enormous birds breed on, St. Croix Island. Locally, this makes them a very rare bird. They tend to be pretty notorious here. 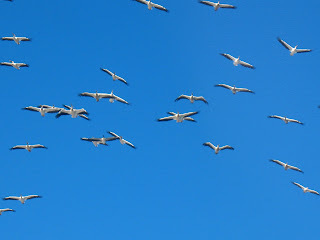 They travel around in groups scaring other seabirds off their nests for a meal. It can be an intimidating sight.